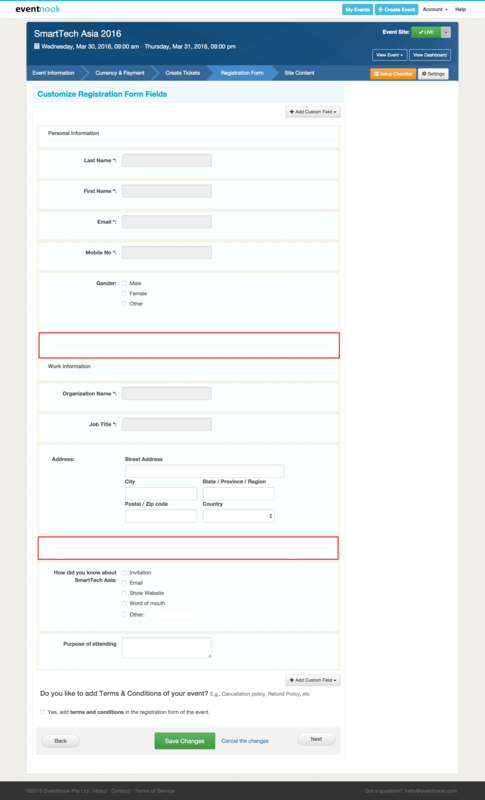 EventNook allows organizers to customize their registration form to collect their attendees' required details. Single Line Text is useful because it allows the attendee to fill up short answers or one word answers. It can also be used to ask many different questions due to its flexible nature. An example would be when you are organising a gathering of Football Enthusiasts, you can ask which Football Club they support! Note: You can put a limit on the maximum number of characters for the answer. Paragraph text is similar to Single Line except as the name suggests, the answer is in the paragraph format. This is usually for longer answers or for full sentences. An example would be when you are organising a coffee making workshop and want to know what your attendees want to make. Multiple choice is used when you want to offer your attendees options to choose from for the question. It is useful if you already have a preset of answers you have came up with. An example would be when you organize a conference and want to find out the food preference of your attendee. Note: There are options for you to change the layout of the choices. Checkboxes is similar to multiple choice except attendees can choose more than one option in contrast to multiple choice, where you can only choose one. An example would be when you want to find out how your attendees got to know about your event. Dropdown serves the same purpose as multiple choice. The only difference is that the options will be listed in a menu when the attendee clicks on the field. An example for this is when you organize an international MICE event, you can include this and have your attendees list the country they are representing. Group Header is used when one desires to place all similar /related information together into one unit.In a registration form, you can group related data by adding a group header to the form. Screenshot below shows all personal information grouped together under "Personal Information" whereas all work related information is grouped under "Work Information". 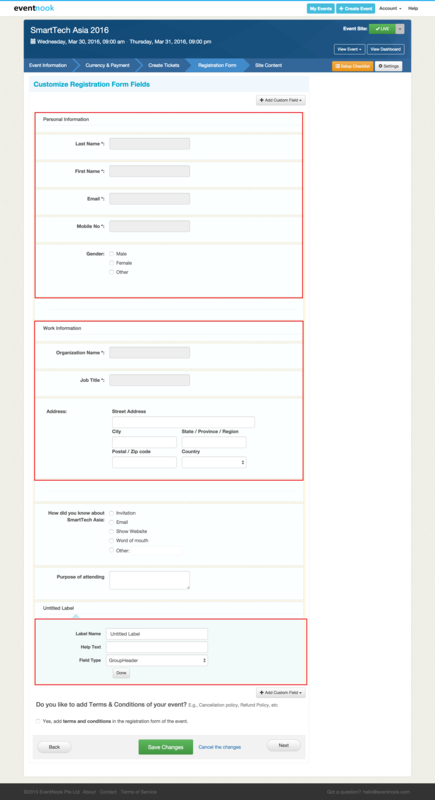 Horizontal line can be used as a visual separator of controls on a form. 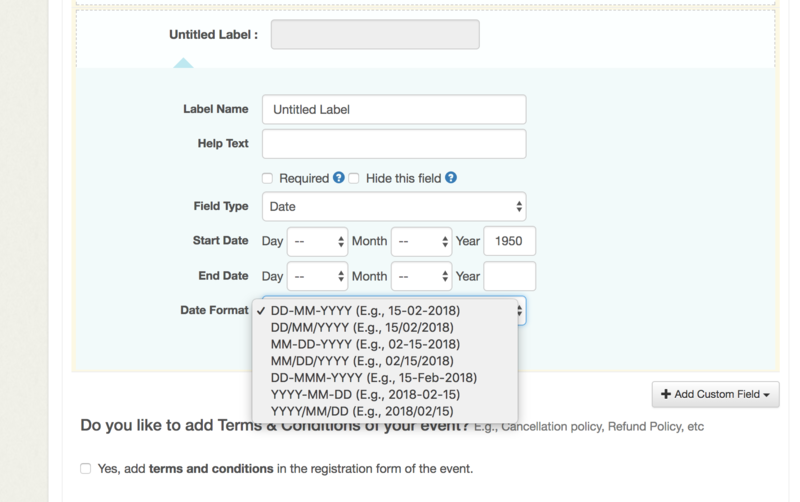 The date field allows users to input dates in various formats. It may be used to obtain an attendee's date of birth, or other information pertaining to trip planning such as their date of arrival, or check-in date. Note that the 'Start Date' and 'End Date' are used to set the oldest and newest dates that can be accepted.